He adds: "Each of the three institutions will make a distinctive contribution to the project, with Liverpool's particular focus being the development and extension of our leading formal verification techniques and tools. These provide strong mathematical proof about the decisions the systems will make and so allow us, in collaboration with Sheffield and UWE, to apply these techniques across a broad variety of complex autonomous systems." The role of the Bristol Robotics Laboratory (BRL), a collaboration between UWE and the University of Bristol, will be to research, develop and demonstrate verifiably 'ethical' robots. 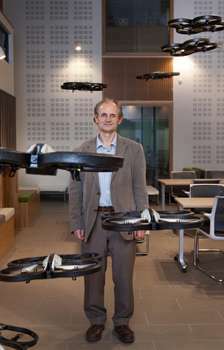 Professor Alan Winfield, of the BRL, says: "If robots are to be trusted, especially when interacting with humans, they will need to be more than just safe. We've already shown that a simple laboratory robot can be minimally ethical, in a way that is surprisingly close to Asimov's famous laws of robotics. We now need to prove that such a robot will always act ethically, while also understanding how useful ethical robots would be in the real world." "Our project will demonstrate the abilities of robotic systems to take decisions based on ethics, law and safety grounds and provide further guidance to legislators and robot developers," adds Professor Veres. Autonomous robots kind of scare me and I don't think I'm alone in saying that. Founder and Producer of boasish.com. Striving to be better than sliced bread.